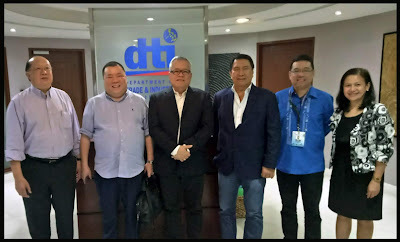 Department of Trade and Industry (DTI) Secretary Ramon Lopez (3rd from L) discussed possible investment promotions collaboration with Travelzen Worldwide Co., Ltd., Group of Companies and DCM Group of Companies Chairman Thomas Tar Pui Kwok (leftmost) and Yeung Marine Holdings Inc Chairman Donny King Shing Yuen (2nd from L). The collaboration will be in a form of a Philippine Investment and Tourism Center at Shanghai, China. According to Sec. Lopez, the partnership will aid DTI in its investment promotion programs and encourage more Chinese investors to visit the Philippines and look for investment opportunities in the areas of tourism, real estate, and food processing. Travelzen Worldwide Co., Ltd., is the largest B2B hospitality related company in China. Meanwhile, Yeung Marine Holdings is a registered Filipino company that primarily engages in sales and trade of various marine products globally. The group is also involved in fruit distribution, food processing, freight forwarding, aquaculture, and construction. The meeting was also attended by Special Envoy to the People’s Republic of China Ramon Tulfo (3rd from R) Board of Investments (BOI) Managing Head and DTI Undersecretary Ceferino Rodolfo (2nd from R), BOI International Investments Promotion Service Chief Lanie Dormiendo (rightmost).